The Expert Advisor which uses the AO and AC indicators in its operation, which were proposed by the Bill Williams. The EA buys at green AO and AC, sells at red AO and AC. The market exit is performed when any of the indicators changes its color. 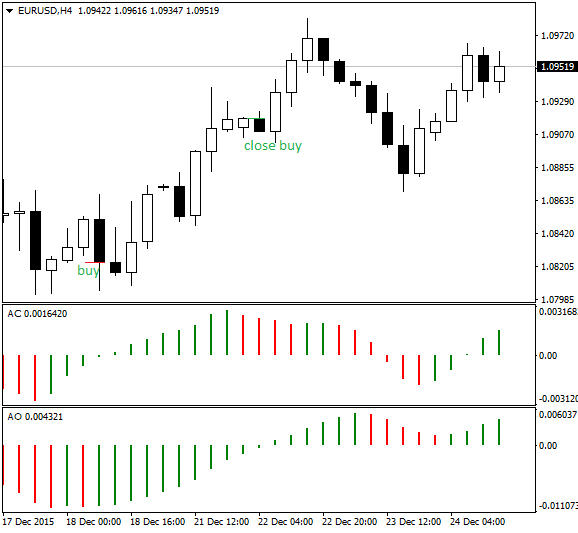 It is recommended to use the indicator on the H4 timeframe. Number of lots — number of order lots. Order's comment — order comment. Magic Number — EA's magic number. Due to the simplicity of the algorithm the EA does not require complicated settings. The automatic lot calculation depending on the deposit can also be implemented.